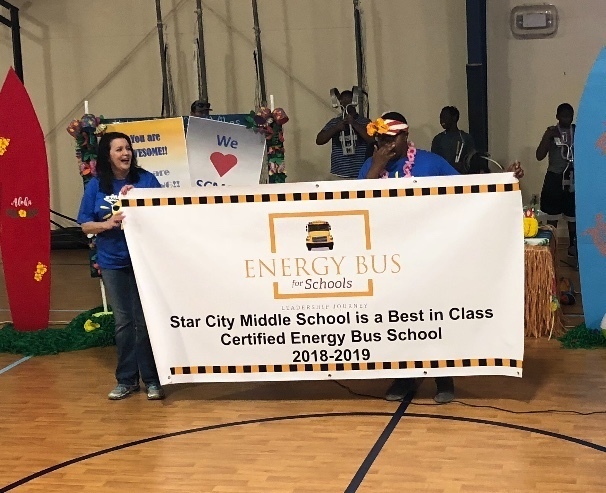 Star City Middle School was recently awarded and recognized as a Best In Class Energy Bus School. The middle school was given this recognition for multiple reasons involving the Energy Bus program. These reasons include: applying the seven principles from the Energy Bus, having a solid vision/mission that is shared by all members, and having a strategy in place to sustain a positive school culture. In order to receive this recognition, the school must qualify in all of these areas. SCMS is recognized as going above and beyond making sure the campus is a positive environment. The middle school had many different ways of making their campus a positive environment. Motivation is something that the faculty and staff try to apply every day and keep as their focus. The motivational focus reminds students to work hard. There are motivational quotes posted throughout the school (in the hallways, classrooms, and more) which students see and read everyday. During the morning announcements, there is a positive, motivational message that is given to help everyone start their day with a positive, hard working attitude. The teachers, the staff, and the students are very grateful for this recognition of being the Best In Class Energy Bus School. “We are very honored. We are the first and only middle school in the country to be awarded this award. It’s through our faculty and students’ hard work that made this possible” (Gina Richard, Middle School Principal). This award is valued by the middle school and they are very proud to be recognized. In celebration of the honor the Middle School held a field day last Friday, that included many community sponsors, and fun was had by all!